Plans for wood burning power stations have been rejected by planners at meetings in neighbouring counties. The biomass plants proposed for Swansea and Kidwelly in Carmarthenshire had divided opinion. Objectors raised concerns about air quality and health implications but reports said they were safe and could create almost 200 permanent jobs. At separate planning meetings councillors from both local authorities rejected the applications. Members of Swansea council's planning committee made a visit to the proposed site between Kings Dock and Queens Dock in the city before reaching their decision. Over 80 people had written letters of objection and five petitions containing more than 800 signatures were submitted. They were anxious about the health implications of burning wood chip close to their homes, said it could affect the future development of the SA1 waterfront and claimed there was a lack of consultation. Dingle Holdings Ltd which was behind the scheme said it would be a major boost to the local building industry during construction and would create up to 90 permanent jobs. Wood chips and pellets brought to the site by sea and rail would be burned to generate high pressure steam to power a turbine. It said it would produce enough electricity to power 80,000 homes while excess heat could be used for off-site ventures such as a community heating system. The Unite union had written in support of the plan stating that south Wales imported its power from England resulting in one of the highest electricity prices in the UK. It said aluminium manufacturer Alcoa cited high energy prices as a major factor in its decision to close its Swansea factory, with the loss of 300 jobs, last year. A similar plant had been proposed for the former Coedbach coal washery site at Kidwelly by Bio E PLC. Councillors in Carmarthenshire visited an equivalent power station in Lockerbie in Scotland earlier this month to see how it would operate. 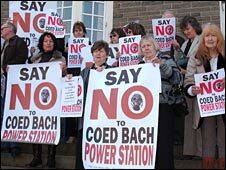 The Kidwelly plant had also attracted public opposition and councillors voted nine to eight to turn it down.